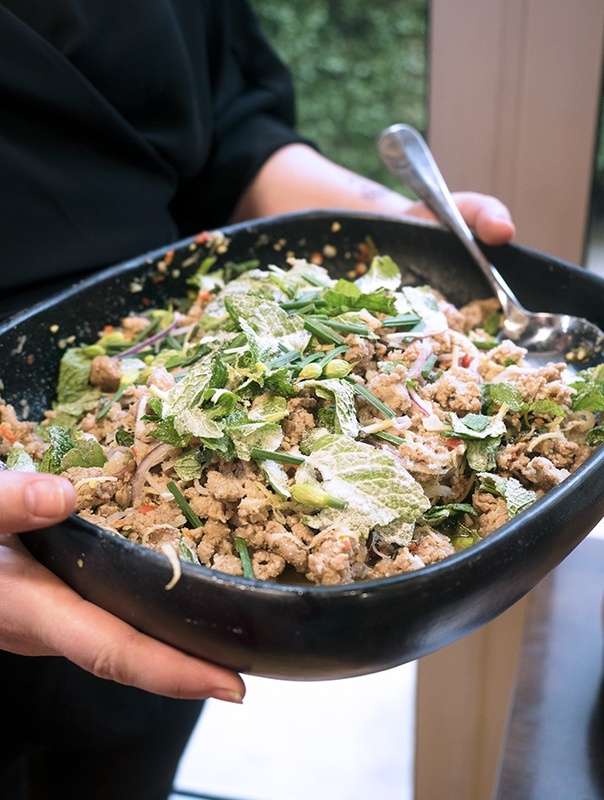 Home » Duck Larb Recipe + why can we eat pink duck meat? Duck Larb Recipe + why can we eat pink duck meat? Scrumptious Duck Larb recipe. 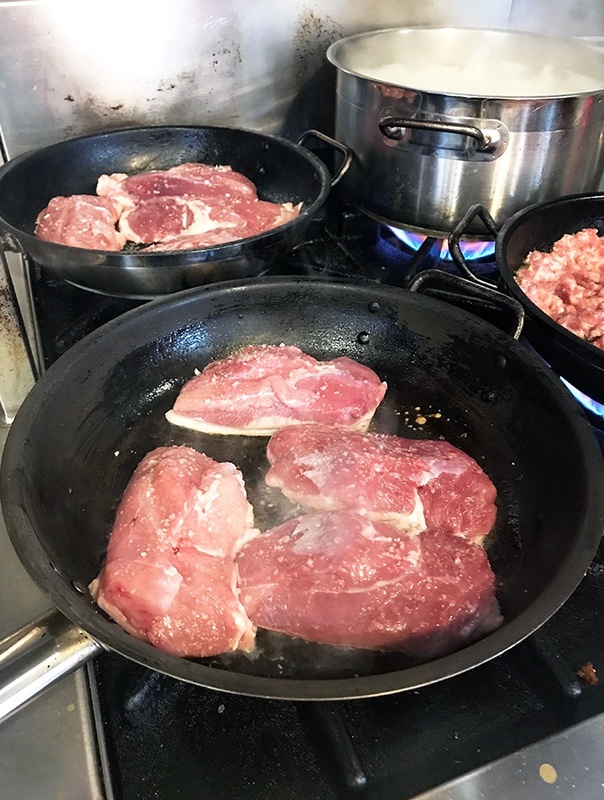 Plus I answer the question of why can we eat pink duck meat and not chicken? I cook, I cook a lot. I probably spend too much time in the kitchen developing and experimenting. But I still have so much more to learn, you never stop learning. That comes apparent every time I attend a master class. 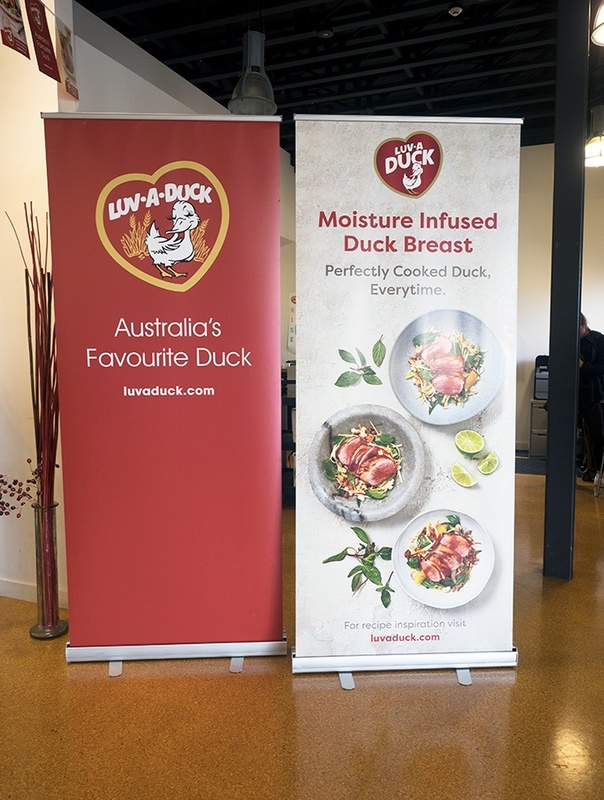 Recently I had the pleasure of attending an intimate masterclass at Luv-a-Duck’s headquarters in Melbourne to celebrate their 50th anniversary. The chef sharing his duck cooking knowledge on the day was Adam D’Sylva. Adam is co-owner and Executive Chef at Melbourne’s Coda and Tonka restaurants. 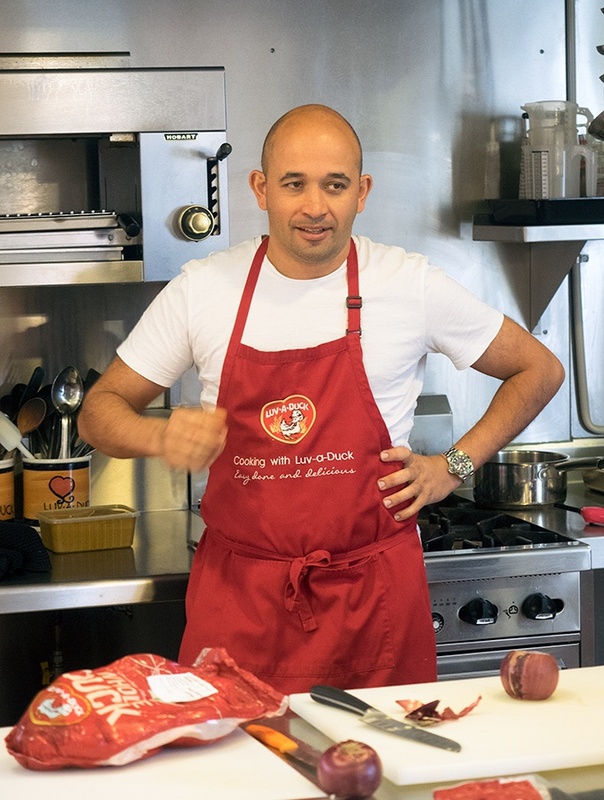 Adam is often seen on MasterChef sharing tips, tricks and setting pressure tests. Luv-a-Duck is an Australian owned family business, started by Art Shoppee on a bet. Art bet a neighbour that he could grow ducks better than they could. And that’s what he did with 20 ducks, the result the begining of Luv-a-Duck. His daughters now carry on the business, and the third generation has also jumped on board, Art’s granddaughter. The company was inducted in 2017 into the Family Business Australia Hall of Fame. Duck is a meat I wasn’t 100% comfortable cooking with before the masterclass. Are you like me and often wondered how chefs are able to serve duck pink? I accept it, I eat it and I thoroughly enjoy it. But there is still a part of me that wonders if I will die. Okay that was a little dramatic, but serving pink chicken (or turkey) may have serious consequences? Like death, a trip to hospital, or on the less extreme side spending serious time head first in the toilet. Why can we eat pink duck meat and not chicken? The main reason being, duck is not chicken. Obviously it isn’t a chicken, but they are both birds right? Yep they sure are, but one is a bird of flight and the other isn’t. They are not created the same. 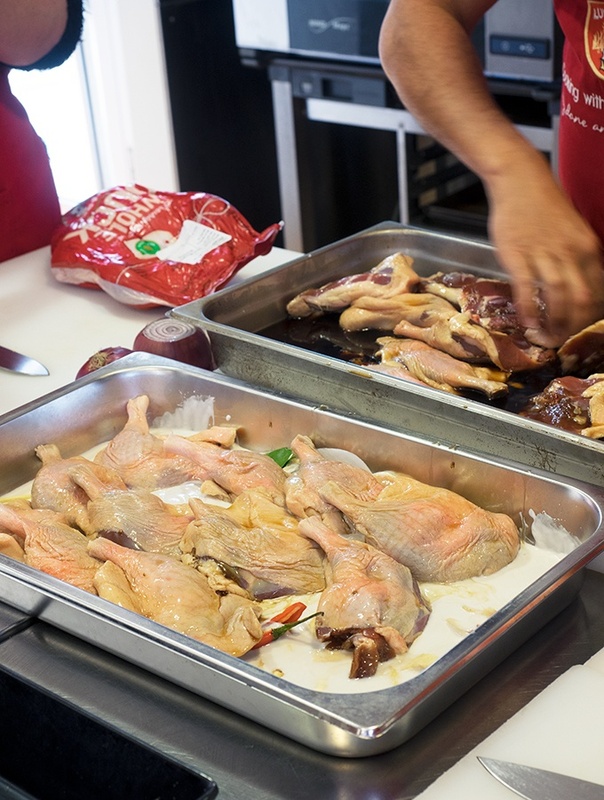 For cooked chicken and duck the internal temperature is surprisingly the same. When tested with a thermometer at the thickest part of the duck (or chicken) the temperature should be 75 Deg C (165 Deg F). The difference is that duck is red meat and chicken is white meat. Therefore, the duck meat will still appear pink when cooked safely to this temperature. Why is duck a red meat and chicken not? It is all about flight. As ducks are a bird of flight they need far more oxygen in their muscles to get them flying high. Oxygen is transferred to the duck’s muscles (the meat) via myoglobin. 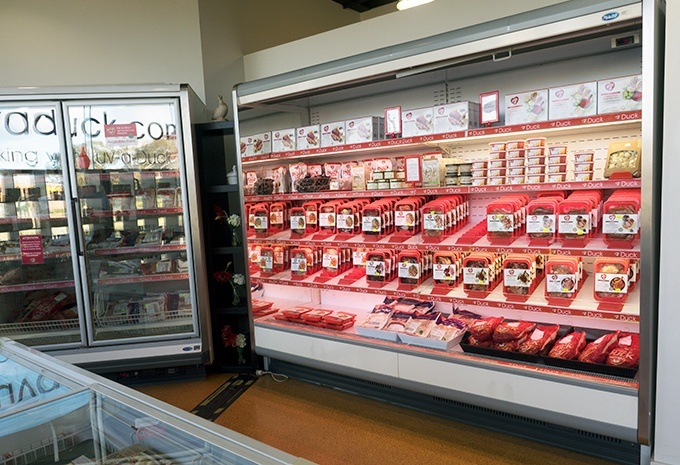 This is what gives the meat its red colour. 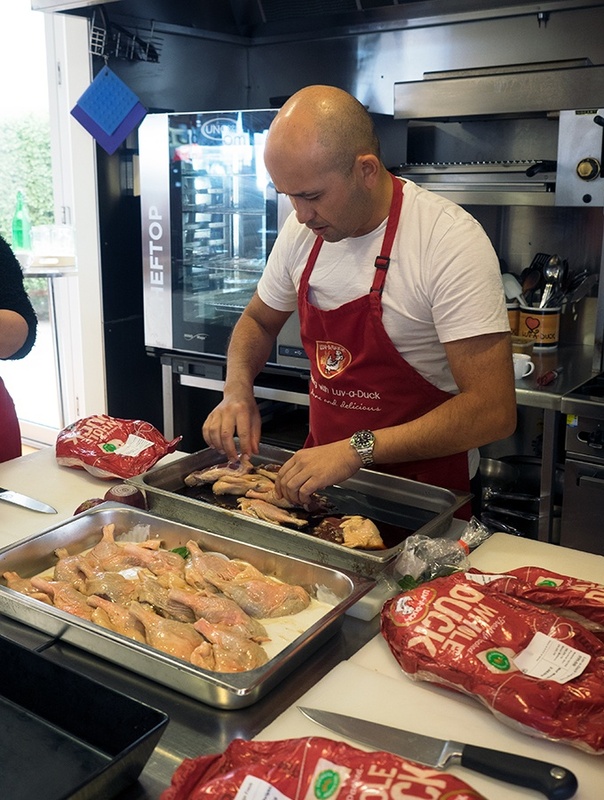 Ever wondered why chicken legs are dark meat compared to the rest of the chook? It’s for the very same reason, more oxygen being delivered to their little hard working legs. I hope that makes a little more sense now as to why you can eat duck meat that still has pinkness to it. 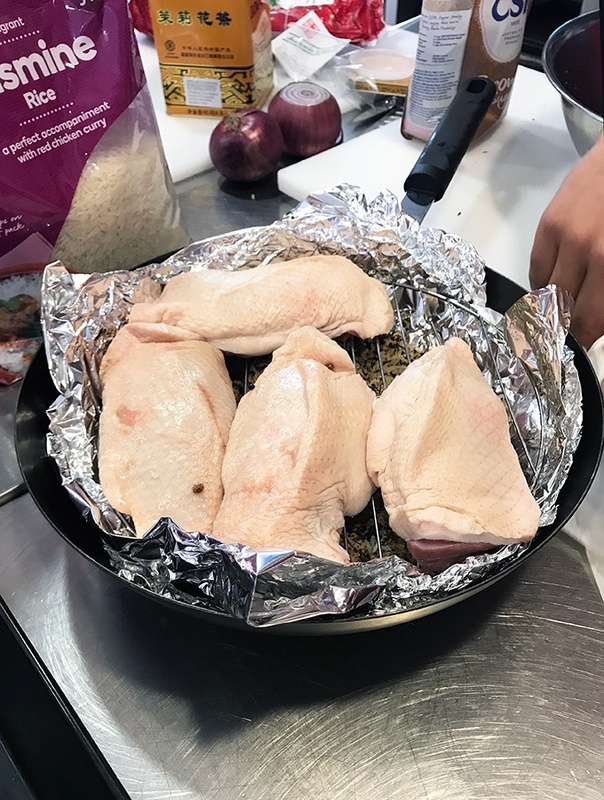 Duck breasts being cooked in a pan perfectly, end result is crispy skin and pink meat. During the masterclass we were very hands on. 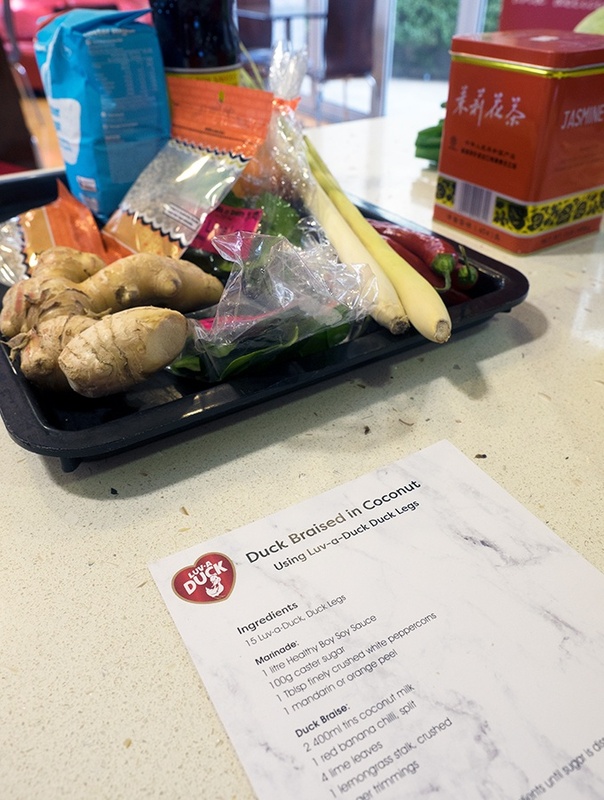 I learnt how to break down a duck, and we made a few dishes to enjoy over lunch. 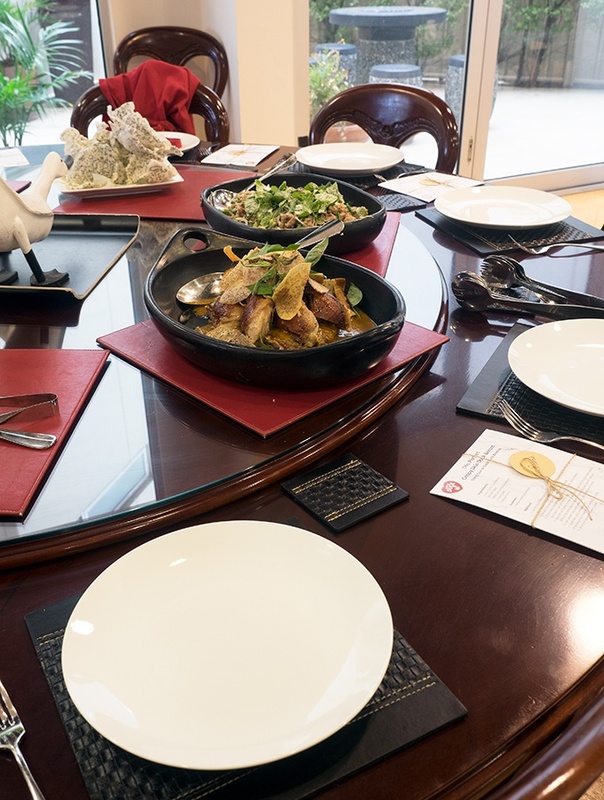 After enjoying our masterclass with Adam we relaxed around the large dining table with a super sized lazy susan at the Luv-a-Duck kitchen and enjoyed our hard work. Perfectly cooked brined and tea smoked duck breasts. We made fresh rice paper rolls using the tea smoked duck breasts. The rest of the tea smoked duck breasts were used in a fresh Thai style duck salad. 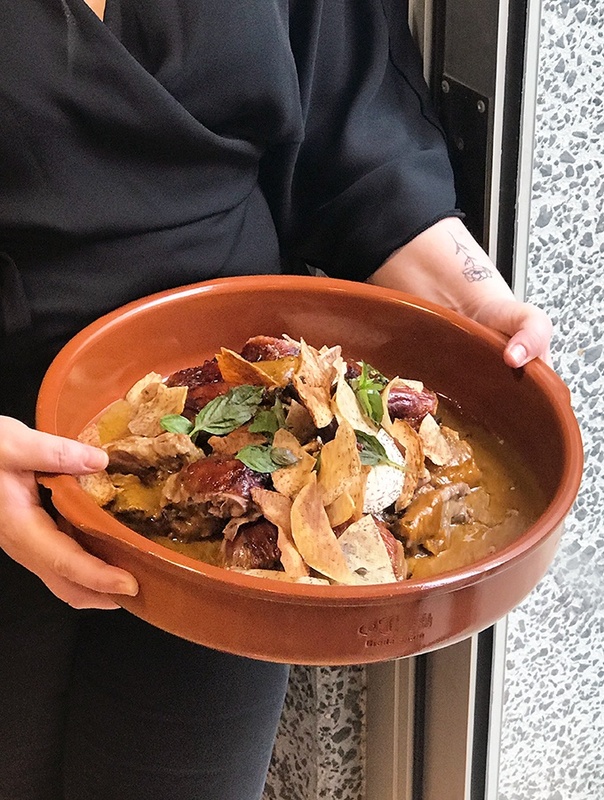 Duck legs braised in coconut served with Adam’s famous curry from Coda in Melbourne. Sadly he didn’t share the recipe for the curry, but we did learn the braising technique. Duck larb with puffy black sesame seed rice crackers. 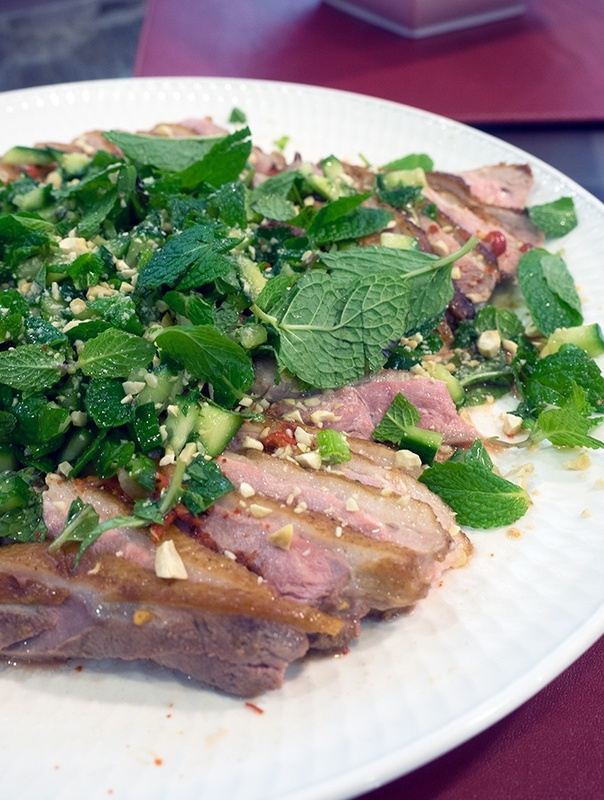 It’s my favourite Luv-a-Duck recipe of the day that I want to share with you, duck larb. 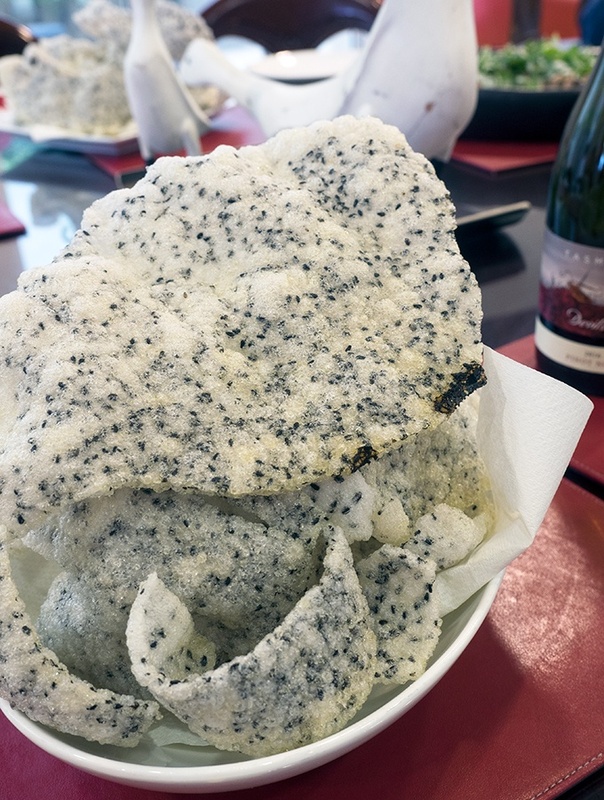 When teamed up with puffy crunchy fried black sesame rice papers it was a winner for everyone. I loved the simplicity of the duck larb but, yet it still packed a flavour punch. Meat Mincer: You will need a meat mincer to mince your duck meat. If you don’t have a mincer at home, ask your butcher to mince your duck meat for you. Adam introduced us to frozen minced lemongrass. Far cheaper than buying lemongrass stalks, less time consuming as it is already minced for you. It is available at Asian grocers. If you can’t find frozen minced lemongrass very finely chop a couple of lemongrass stalks. Also known as wild pepper, kadock, bai cha plu, cha plu and betel pepper. They are a fresh product that are available at Asian grocers in the vegetable section. If you can’t find them it is okay to omit them from the recipe. As the name says it is powder made from roasted rice. This is easily made at home or can be purchased at your local Asian grocery store. To make at home: Place ¼ cup of non cooked jasmine rice in a fry pan over a medium heat. Slowly dry fry the rice (do not use oil), stirring continuously, until it changes texture and starts to go golden. This will take around 15 minutes. Remove from heat and leave to cool. Once cooled use either a mortar and pestle or grinder to make the roasted rice into a coarse powder. Store any unused powder in an air tight container. 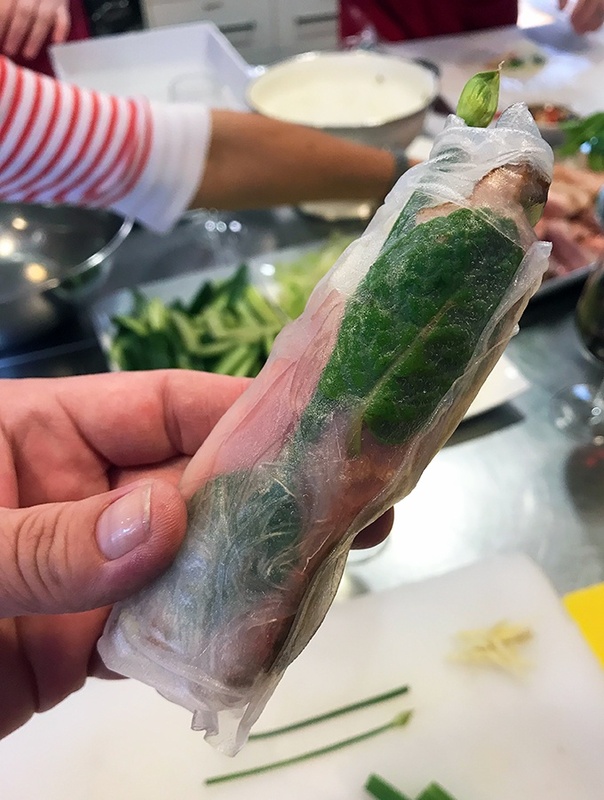 They look similar to the rice paper that you use for fresh spring rolls, the ones you dip in water to soften and then wrap ingredients in, just like my fresh flower rolls. The difference is that they are a little thicker and heavily studded with black sesame seeds. When fried in oil they puff up like prawn crackers do. You can buy them, guess where? Yep, your local Asian grocery store. Any left over duck larb can be kept in a container in the fridge for a day or two. 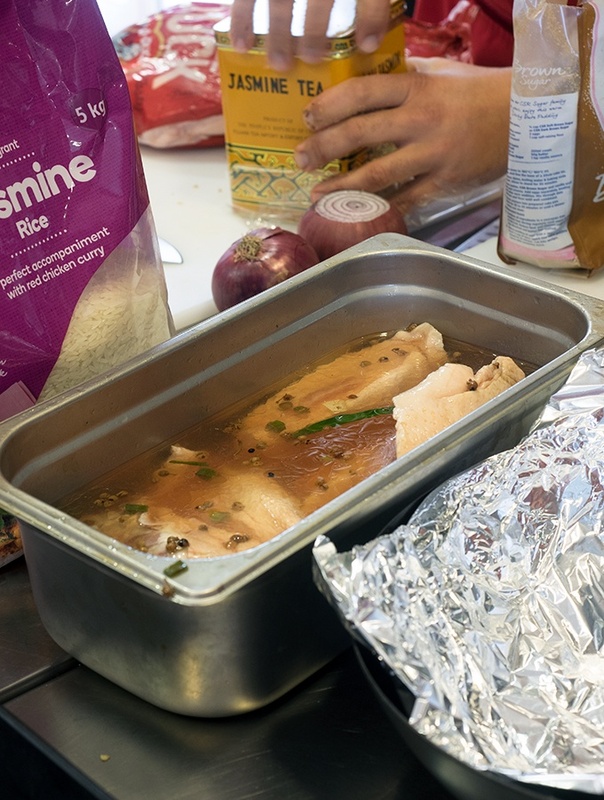 Leftovers cannot be frozen. The cooked black sesame rice crackers can be stored in an airtight container. I do hope you feel a little more confident and understanding regarding duck meat. I will be sharing a few more recipes with you over the next couple of months as I now have my duck confidence! 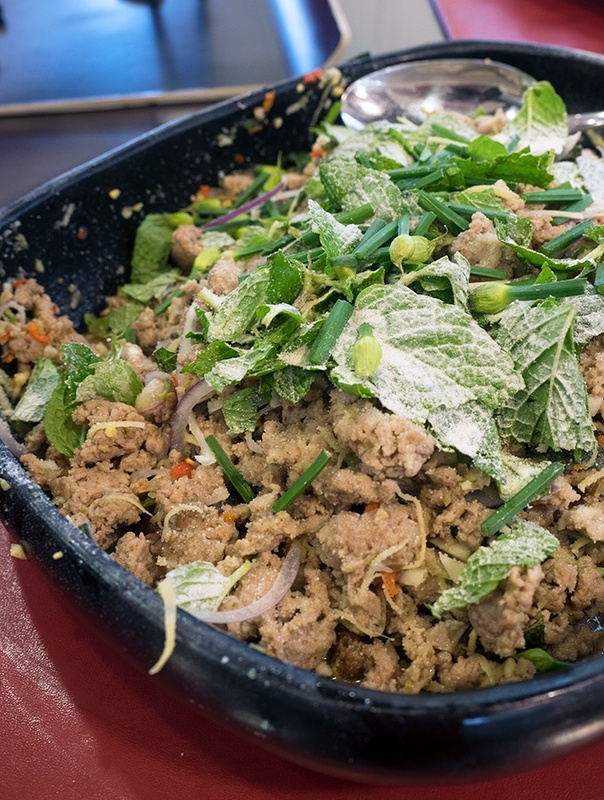 Scrumptious Duck Larb recipe using duck leg and breat meat. A simple dish using key aromatics. In a hot wok add duck mince and cook until browned. Add chilli, lemongrass and garlic, cook until aromatic. Season duck mixture with fish sauce and palm sugar. Remove mince from wok to a serving platter. Leave any remaining fat in the wok. Toss Thai basil, chilli, betel leaves, cashews, onion and mint through the duck mixture. 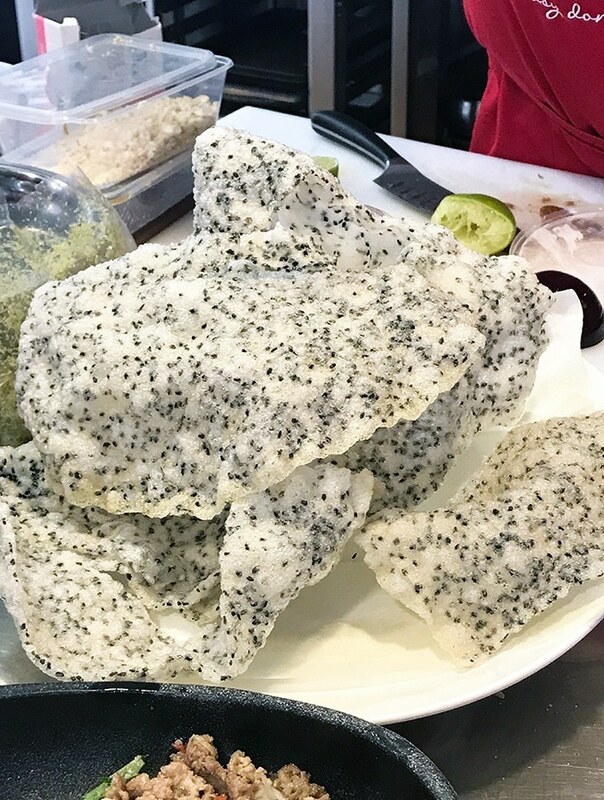 Sprinkle roasted rice powder over the top and serve with crispy black sesame rice papers and lime wedges. Wow. This looks really fantastic. Thanks you so much for your helpful shearing post! 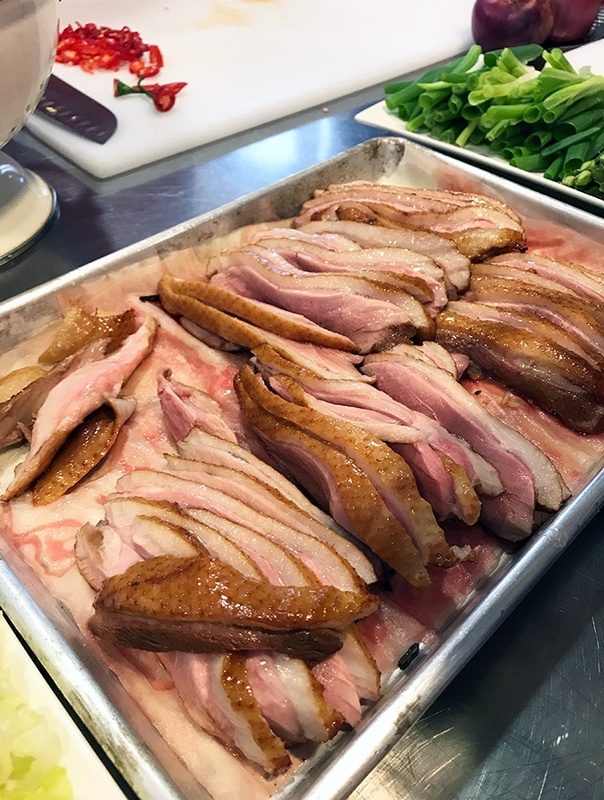 What a great and in depth article on cooking duck! I love duck yet we don’t eat it often. I’m thinking of making some this week! I was exactly the same before this hands on class. I feel so more confident now on cooking duck. This looks fantastic! I love that there are some cashew nuts sprinkled on top too! I loved the added cashews too. It looks like you had so much fun! What a great event! And all of the food looks amazing, especially the larb! It really was such a fun masterclass to attend, and totally delicious! That duck larb looks so good – thanks for informing me on a few things I didn’t know about ducks too! It was definitely a duck educational. Yum, yum, yum! Totally making this! It’s such a great alternative to chicken larb.